District Strings is a group of classically trained musicians providing versatile and affordable live entertainment. Based out of College Park, Maryland, District Strings serves the District of Columbia, Maryland, and Virginia area. 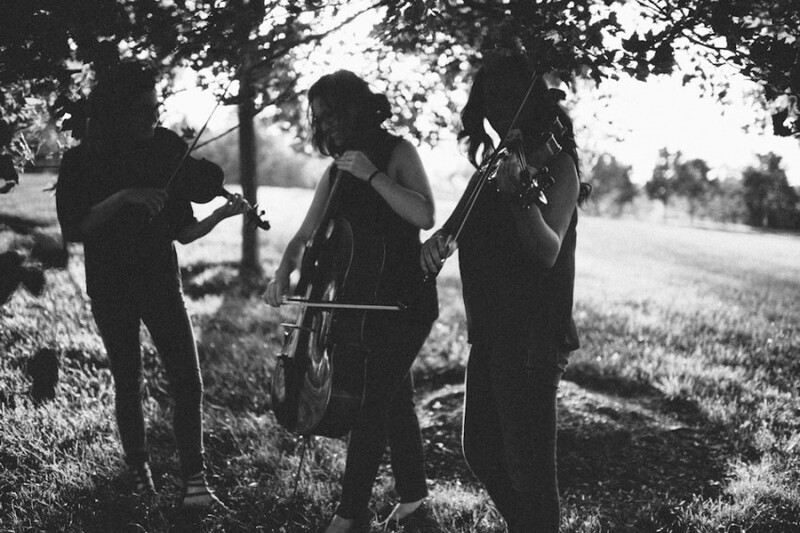 District Strings is available for your next special event whether you need a string trio, string quartet, string duo or a solo performance. Wow! These are the best musicians I have ever worked with - and I've work with a lot of musicians in my long career. They were tasked to perform new music - some of which was very tricky - and they pulled it off beautifully. Perfect for our wedding ceremony. District Strings did an awesome job on our wedding day!! The added such a romantic touch to our wedding ceremony. They have a huge list of songs to choose from and will give you advice if you have any questions. They were very responsive and easy to communicate with through the whole process. I am so happy that we chose them for our ceremony. Thanks for the review, Jenny! It was an honor to be a part of your beautiful ceremony! The trio from District Strings was exceptional. Our wedding was on 9/19/15 at Maggiano's in Friendship Heights and the music provided by this trio was perfect for our wedding. The crew was always responsive, professional, and highly talented. They played some wedding favorites as well as honoring our own requests. The greatest moment of my life was seeing my beautiful bride Angela walk to me to join my hand to our request of "I can't help falling in love" by Elvis. Thank you ladies for enhancing this memory that will live on forever. Our experience with District Strings was exceptional. The String Quartet added that special touch of beautiful music for everyone. We lean on District Strings a lot to help with our wedding ceremony, and they were amazing! They worked with us to make the whole thing easy, and were responsive, professional, and calm during our very hectic wedding day! Thanks for the review, Matt! Thanks for making us a part of your beautiful ceremony! Erin was awesome and played beautifully. Played requested songs, sounded great, and were on time. Made the night very special! Very professional and beautiful sound. Katelin, Alexa and Erin played beautifully at our daughter's wedding. Their instrumentation was masterful as they mixed classical with contemporary selections. We asked them to accompany the church pianist and singer on The Prayer and they lifted this beautiful song and created a memory for us (with only a few minutes practice with the pianist). I highly recommend District Strings for any memorable event! 5 Stars! The audience was captivated, engaged and intrigued displayed by applause and gasps of gratitude. The duo violin and piano with a splash of opera was a perfect paring for the occasion. I manage a non-profit, and hired District Strings for a fundraising event. They were professional, friendly, dressed nicely, and played a wide variety of songs. My guests were very impressed, and complimented the music all evening! Their pricing is very reasonable as well. I will absolutely use these musicians again for upcoming events! We had two of the members of District Strings perform for our group of senior citizens. They were extremely talented and talked about the pieces they were playing and answered questions at the end of their performance. I would definitely book them again! They were amazing! Very professional, extremely talented and VERY enjoyable! I am very please that we hired to perform for our group! A wonderful, talented, and professional group! It is hard to capture all of the positive things I have to say about District Strings, specifically Erin and Kaitlin, who were hired to play for my wedding ceremony and cocktail hour in this short review. I was at a bit of a loss when it came to who I wanted to play during the ceremony and I am beyond lucky I found District Strings. Kaitlin was professional and prompt in all of her communication, the group was affordable, and they were so easy to work with. I gave them very little direction in terms of what songs I wanted played and they were able to create their own playlist and play beautifully with very little guidance from me. I received numerous compliments about the music from my guests after they finished playing. I would highly recommend District Strings! The district strings arrived on time, set up and played the perfect music for the party we had. The music was perfect, just the right volume and added exactly the touch we wanted to the event. If you are looking for a string trio, look no further. Excellent music, totally professional and easy to work with. We had Kait and Erin from District Strings play the music for our wedding ceremony and cocktail hour on 5/9/15 and they were outstanding! On top of being very affordable, they learned a song specifically for the bridal entrance and performed it fantastically. We could not have asked for better musicians for our special day and would recommend them to anyone! I have only wonderful comments regarding these three lovely and talented women! They were on time; they played exquisitely; our guests thoroughly enjoyed their music and the ambiance they provided; and most importantly, they added that "special touch" to our daughter's intimate outdoor wedding. They were pleasant and professional to work with before the wedding. All questions were answered promptly. Have no hesitation in booking them for your event!!!! I had a unique request and Kaitilin did a great job of listening to my needs , addressing my concerns and providing feedback from the initial request to post performance. She delivered a great performance that was enjoyed by all and I would definitely use her services again and refer her to others. District Strings is a group of classically trained musicians providing versatile and affordable live entertainment. Based out of NW Washington, D.C., District Strings serves the District of Columbia, Maryland, and Virginia area. District Strings is available for your next special event whether you need a string trio, string quartet, string duo or a solo performance. Check out http://www.districtstrings.com/repertoire for a complete rep list!